This dish is magical for its lightness, freshness, flavor and hotness. If you thought that the enchiladas were out of reach of any low calorie diet, these enchiladas come to prove otherwise since it is possible to enjoy of some light enchiladas , thanks to the cottage cheese. In this recipe the cottage cheese is accompanied with more ingredients to give it more flavor, then it is wrapped in tortillas and they are covered with a sensational red salsa. At the end the enchiladas are garnished with many ingredients that you won’t be able to resist. – There are Mexicans that doubt if the combination of cottage cheese with salsa and tortillas; is adequate. And this is quite valid because the Mexicans tend to associate the cottage cheese with fruit since that´s how it is commonly served at the restaurants. Well, the reality is that this combination of cottage cheese and more ingredients is fantastic – there’s nothing to fear. The combination of flavors is exact, is precise, is a delight. Try it you won’t regret it! You can put to this main course more flavor and more color accompanying it with some refried beans , a guacamole or a mixed salad. To make these enchiladas there is a lot of work to make but everything is explained in detail so you won’t have problems. If you want some spicy enchiladas you can add in the ingredients 1 arbol pepper and use it in the salsa preparation. Would you like to prepare your own corn tortillas for the enchiladas? It is very important to use vegetable oil in the preparation because it is the most adequate to fry tortillas. Remove the seeds of 2 ancho peppers and 4 guajillo peppers. Bring the saucepan water to a boil over high heat and leave the ingredients cooking in the boiling water for about 5 minutes, until the chilies soften. Transfer from the saucepan to a blender, with a kitchen spoon, the chilies and the tomatoes that were cooked. 1/4 of an Onion (1.7 oz). The Red Salsa that was blended. When the salsa boils reduce to medium heat and cook it for about 4 minutes, until it thickens a little and acquires a more intense red color; stir occasionally. Then set aside. Cut 1/4 of a lettuce into strips, then reserve. Finely chop 1/4 of an onion (1.7 oz) and 5 coriander sprigs; then set aside. 1.1 lbs of Cottage Cheese. Heat over medium heat the red salsa that was cooked for about 2 minutes, until it is very hot. Take with the tongs one of the fried tortillas (that was put on the paper towels) and dip it in the red salsa that was heated. Repeat the same procedure with the other 9 tortillas that were fried. Upon completion if there is red salsa remaining pour it over the enchiladas. Suggestion: These enchiladas can also be garnished with avocado , which gives a very good flavor and an interesting color contrast. 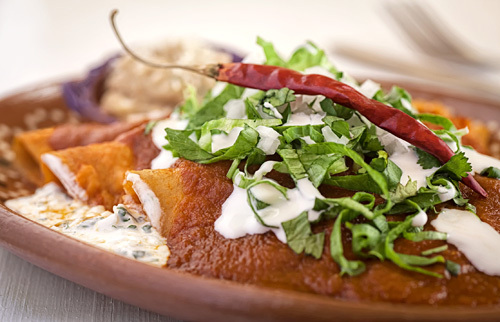 Variation: Try the enchiladas with a different color: green enchiladas with cottage cheese. Here are the arbol peppers that are used to give hotness to the enchiladas.